Exclusive interview with El Desperado! His challenge to KUSHIDA on IWGP Jr Heavyweight Championship coming up tomorrow! –So, we’re a matter of hours away from you challenging KUSHIDA for the IWGP Junior Heavyweight Championship. What’s your mental state at the moment? Desperado: Challenge? I’ve said this any number of times, but I don’t feel I’m challenging him at all. He lost to me in Best of the Super Juniors this year, right? If I’ve beat him, why am I challenging him? He just has a belt that I’m taking back. –So what do you think of KUSHIDA right now? Desperado: What do I think? My thoughts on him haven’t changed a bit for years. He isn’t frightening at all. He isn’t intimidating at all. He’s a good wrestler, sure, but he’s just a guy. –You last challenged for the IWGP Junior Heavyweight Championship in October 2014 against Ryusuke Taguchi. What’s changed over those three years with you in Suzuki Gun? Desperado: Changed? 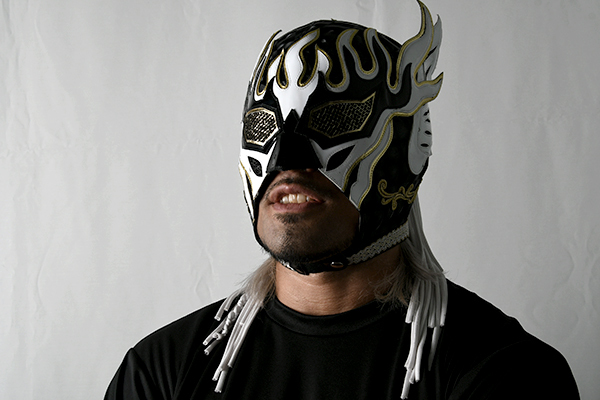 Well, first let me get this clear: I chose to wrestle in Japan because I wanted to be in Suzuki Gun. –So as soon as you appeared in New Japan at the Tokyo Dome at Wrestle Kingdom 8, you wanted to be in Suzuki Gun? Desperado: Right. For the first six months or so, I was in the core roster, but never felt comfortable. I reached out to the Boss, and to Taichi, and they said that before I could enter Suzuki Gun I would need to get used to the Japanese style. That’s the only reason I played nice. –And then when you joined Suzuki Gun, your true self came out? Desperado: That’s right. I could be me, and find my true style. It’s not about what changed in me, it’s that I was finally able to pull from the bag of tricks that makes me me. –So, what does the IWGP Junior Heavyweight Championship mean to you? Desperado: Well, it means you’re the best junior heavyweight in the world. There’s no disputing that. I mean, have you seen other promotions?America, UK, Mexico, I look at them all, big to small, but nothing approaches the level that NJPW’s junior heavyweights are on. But one thing I do want to say to the idiots that think NJPW is the be all and end all of wrestling that they need to open their eyes. –You respect the level New Japan is on, but it isn’t all there is. Desperado: I can’t emphasize that enough. That said, people in other promotions all over the world want this belt, that’s the level of prestige it has. Just right for someone like me. –KUSHIDA is a five time champion. What do you think about that achievement? Desperado: If he’s a five time champion then he lost it four times right? That’s pretty careless if you ask me. Should a guy that inconsistent be champion? –At the same time, though, KUSHIDA has an impressive record abroad, and he’s the current ROH TV champion. Desperado: I don’t know anything about that belt. OK, he’s very active abroad. Maybe. But is that really what he wants? Or does he want a quieter schedule. Is ROH pulling him and stretching him too thin? Is New Japan bleeding him dry? –How do you feel looking back at your win over KUSHIDA during the Best of the Super Juniors? Desperado: I don’t feel anything in particular. It was another group match, and I won. That’s all. I was never coming out of that feeling like something changed. I was better, it was the right result, I won. The title match is going to be the same. That’s all. –You have a lot of confidence against KUSHIDA..
Desperado: I mean, not particularly. I don’t especially feel anything. It’s a match, I will win, and I’ll have the belt this time. And he won’t have any excuses after the match, he won’t be able to say that it isn’t over because it was just the opener. Didn’t he say something stupid like that? –That’s right. His only comment was that you hadn’t won, it was the opening match. Desperado: Isn’t that ridiculous? So he’s saying whoever he was against, if it was a snot nosed dojo kid, he’d lose to him, too? That I’m that level to him? –Suzuki Gun tend to be anything goes, and you tend to fight dirty as a unit. Will this title match be the same? Desperado: Woah, hey, wait a second. Have you seen us lose by disqualification lately? Have you? –Well, if you put it that way, not lately, no. Desperado: Look, it’s in the rules. Break it up by a five count and you can do what you want. What about a closed fist? A punch in the face? That’s an illegal move. But who does that? –You mean KUSHIDA’s Masato Tanaka punch. Desperado: See, he’s the guy who takes the cowardly route to victory. Me, I play exactly within the boundaries of the rules. I’m a true sportsman. –KUSHIDA has been quite acerbic toward you. 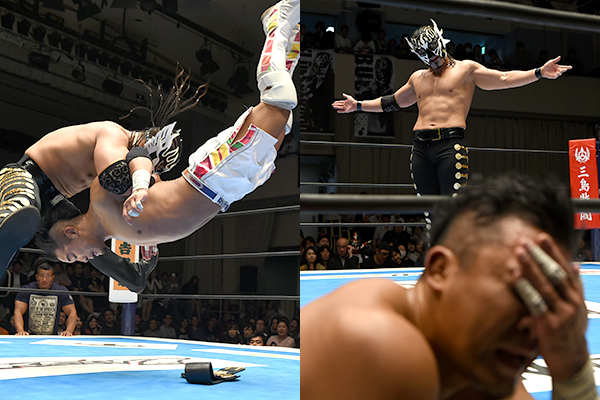 He did recognise your abilities, but also said that you were the fourth string junior in Suzuki Gun, that you were subordinate to the other members. How do you refute that? Desperado: Fourth string? There might be Kanemaru, TAKA, Taichi there but I don’t think I’m any better or worse than them. If he thinks I’m worse, then he should try and prove it in Hiroshima. Because I intend to show the whole world that he’s lower than the dirt on my shoes. — Comparing Suzuki Gun to other factions, it seems you have far more loyalty as a unit to Minoru Suzuki as your leader. Desperado: We call him the Boss because that’s what it is. If he tells us to do anything, we’re happy to do it. If he says the sky is green and crows are white, then that’s the way it is. 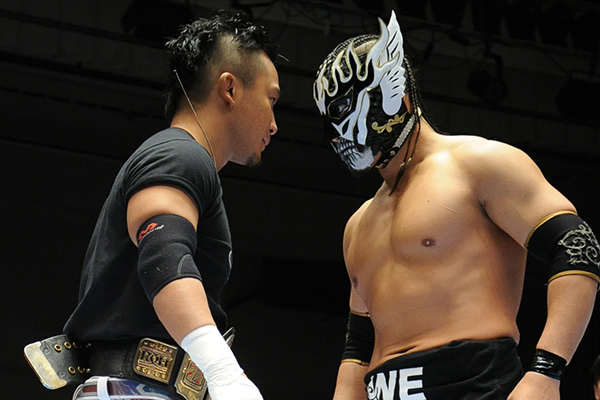 –That said, you have the chance to be the first Suzuki Gun member to hold the Junior Heavyweight Championship. Do you see it as a chance to prove yourself? Desperado: You dangle the most prestigious belt in the world in front of any wrestler and they’re going to go for it right? But as far as KUSHIDA goes as an opponent, there’s nothing to prove. I’m not scared of him in the least. –You’re back in New Japan, and you’ve got a title shot in the semi main event of a major show- a first for you. Does that excite you at all? Desperado: Satoshi Kojima is in Mexico right now, right? You should ask him. What kind of place is Coacalco? –Kojima had a match there recently. Apparently the ring was in pretty bad shape. Desperado: It’s not just the ring! The ‘locker room’ has dirt floors. The wrestlers have to piss in a bucket. Desperado: And all in front of 30 people, tops. That’s where I put my heart in the ring. We’re chatting here right in front of the Tokyo Dome. You can put 50,000 people in there, but it doesn’t matter to me. However many people are there, I don’t care. Wherever, whenever. If it’s you, an opponent, and an audience, it’s all the same. –For you, it doesn’t matter where you are, wrestling is wrestling? Desperado: Right. Doesn’t matter if it’s a ring that’s just bare steel beams, or a ring in the middle of a crossroads in Mexico, or the Tokyo Dome. It’s all the same. It’s all wrestling. This match is the same. –I see. So in the main event in Hiroshima, Zack Sabre Junior challenges Hiroshi Tanahashi for the Intercontinental Championship. 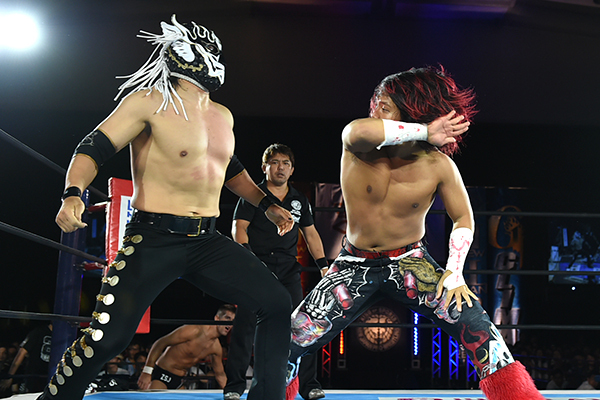 For Suzuki Gun, it’s a chance for two successive big singles wins over the New Japan core roster. Desperado: Us against the company.. well, it’s already decided I’ll win the Junior Heavyweight Championship in the semi main event. Going straight out in the main event to be in Zack’s corner might be pretty tiring. It’s a matter of deciding how best to support him. –You plan on being in Zack’s corner right after your match? 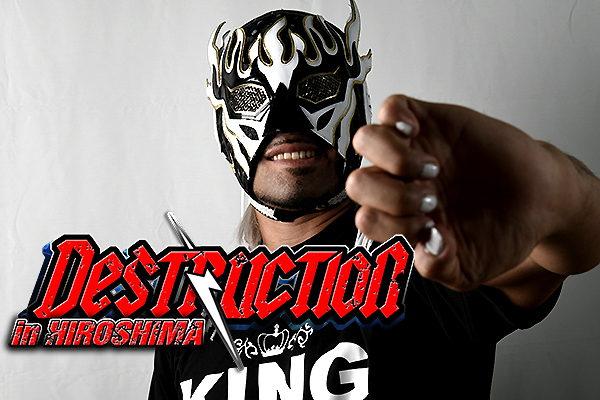 Desperado: I’m wrestling KUSHIDA. So there’s no doubt he’s going to target my arm. But even if he damages my arm to the point I can’t use it anymore, I can still be in his corner. I was in his corner all the way through the G1 after all. –So you will second Zack. Let’s change gears; if you win the Junior Heavyweight Championship, who would you nominate as your next challenger? Desperado: Hang on, now. Has the champion been allowed to nominate a challenger? I don’t think that ever happens. –Maybe not. So what would your plans be as champion? Desperado: Hmm, well, there’s always been an opponent I’ve felt I should face, a name that’s been in my head for ages… but I’m not going to say their name now. Here’s not the place for it. You just want me to say Hiromu Takahashi, don’t you? –Oh, no, no. But that is a match that people would be interested in. Desperado: That’s all I hear! We touched once in a tag match in the G1. I thought he was fast, and that he was a flipping lunatic. That’s all. There’s a different guy I want to face. –That tag match was August 2 in Fukuoka. You said afterwards “huh, there’s some really interesting people out there”. Desperado: Huh. Well, I don’t remember. Anyway, the guy I want to face isn’t Japanese. And I’m not saying his name here. Anyway, the point is, that pathetically boring champion KUSHIDA. Is going to lose to me in Hiroshima, and I will take my belt. We’ll take it from there.